Click HERE to check out the Sofitel Singapore City Centre! While I did try some dishes from the Chinese menu on my first visit to Racines, the only one that really jumped out for me (no pun intended) was the Stir-fried Frog Legs in Spicy Szechuan Salt - they were plump and meaty with the right level of spiciness. The team over at the lobby bar 1864, which is located just next to Racines, have concocted a special (warm) cocktail for the upcoming Lunar New Year. Served in a traditional tea cup with a lid, this Ginseng Cocktail is created for the brave only. While cocktails are typically served cold and I was initially a little bit doubtful about the Ginseng Cocktail, it turned out to be a pleasant surprise - I love the bitter and sweet contrast from this harmless-looking but potent drink. I was fairly excited to be doing the Yu Sheng at this time of the year (considering how it is not even Christmas yet) and the version over at Racines comes with plenty of premium ingredients - these will also be available for takeaway sometime next year (more information to be provided once I have them) but the specially-arranged version will only be made available for diners eating in the restaurant (minimum number of diners apply). 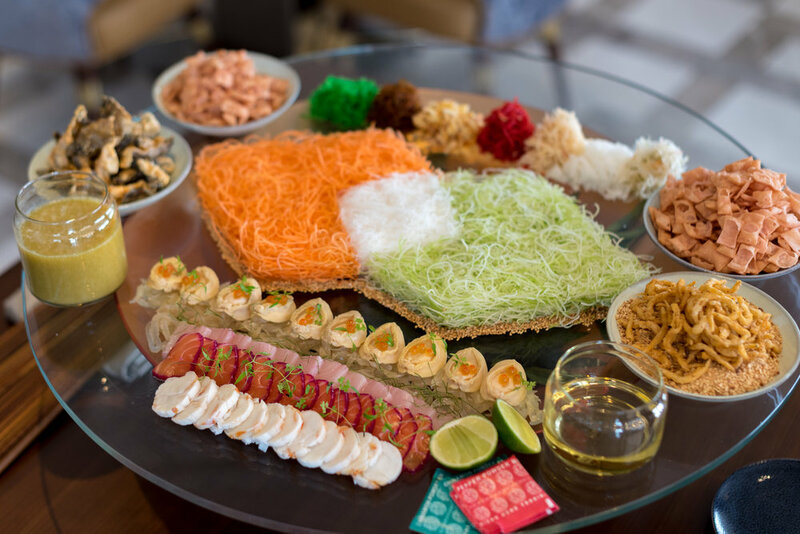 Chef's 8 Treasures 'Yu Sheng' with Yuzu Dressing and Condiments is slightly different from what you would traditionally expect. 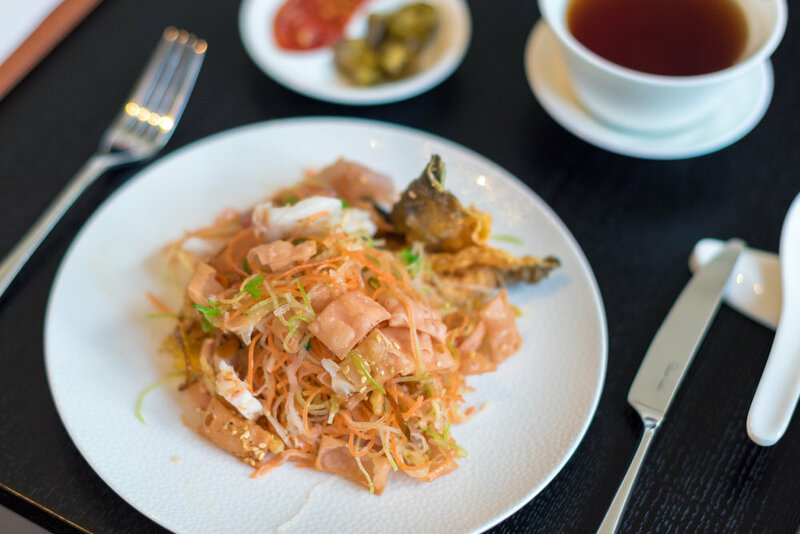 While the base ingredients are similar (fresh carrots and radish), the version over at the Sofitel Singapore City Centre features a much more premium set of ingredients (e.g. abalone) but more importantly, there are actually multiple levels of flavours in this well-known dish it is slightly more sour than usual. Using a Yuzu Dressing, the Yu Sheng here at Racines is not only refreshing but also incredibly light - the acidity from the citrus and the dressing helps to bring out the natural flavours of the raw fish used in this dish. Ikura (salmon roe) is also added to the Yu Sheng and it provides the dish with a burst of flavour and saltiness when you bite into them - my only qualm about this is that the roe actually gets loss in the tossing so perhaps it would be a better idea to serve it only after the tossing has been completed. Nothing gives more credibility to a Chinese restaurant than a bowl of comforting double-boiled soup. 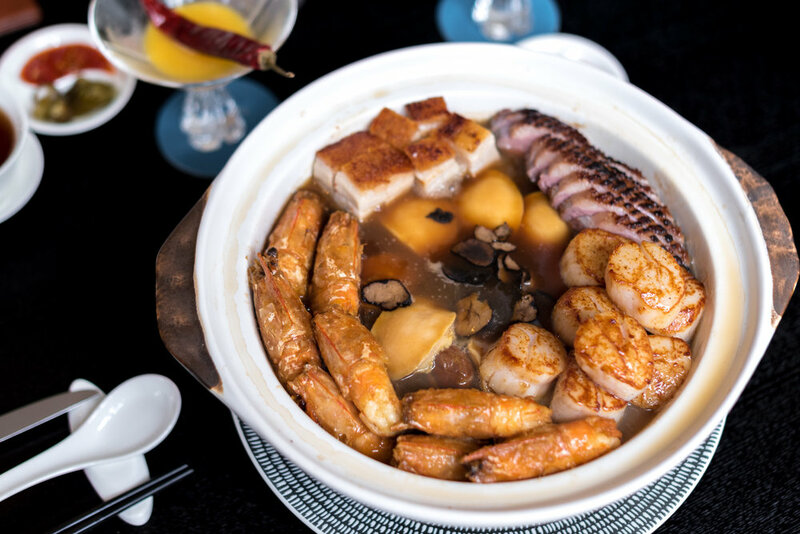 The Double-boiled 'Ang Xin' Chicken with Fish Maw, Conpoy and Morel Mushrooms here at Racines reminds me of a traditional Buddha Jumps Over the Wall but with a slight French touch. While some Cantonese restaurants have started to use the highly sought-after matsutake mushroom, this is the first time I am actually tasting that unique nuttiness in this otherwise familiar dish. In my opinion, this dish was probably the least "French-inspired" throughout the entire tasting menu but don't get me wrong though, it is good and everything you can expect from a carefully-prepared soup - I finished every drop of it! The Tamari-glazed Baked Black Cod Fillet, Edamame and Seasonal Greens is a specialty by the Chinese chef and the perfect-cooked black cod is topped with a secret mixture of bonito. The fish flakes with a fork but still remains firm enough for you to eat it without having to switch over to a chopstick. That rich braised sauce underneath it is a precise combination of sweet and savoury notes that really helped to bring the dish together. Otherwise known as Treasure Pot, Pen Cai is hands-down my personal favourite dish every Lunar New Year. In fact, I make it a point to buy at least one home each year so we can all enjoy this delicious pot of braised ingredients. Sofitel's Seafood Abalone Treasure Pot with Braised Cabbage and Black Moss comes with a lot of what you would expect but it also comes with a few unique ingredients that are not commonly found. For example, the duck breast (commonly used in the preparation of a traditional magret de canard) is pan-seared before adding in to the treasure pot for a bit of texture and flavour. The plump Japanese scallops were also among the crowd's favourite and those too were given a quick sear before being placed into this delicious pot. Another interesting addition to this Pen Cai is the sliced black truffle which as far as I know, has not been done in Singapore. With that being said, I did find the truffle flavours to be extremely mild and it did not seem to matter whether or not it has been added - it is a good thing actually since that braised sauce is already perfect on its own! The Steamed Fragrant Rice with Chef's Selection of Waxed Meats and Bok Choy was perhaps the weakest link that tasting in my opinion. Perhaps my childhood in Singapore has led me to associate claypot rice with burnt edges and dark sauce - both of which were not present in this version - but that is how I like (and expect) it to be. Even though the rice was not cooked in the claypot itself (it is probably transferred into the claypot only when it is done), it was fairly fragrant and diners have the option of adding more light sauce over to the rice to give it more flavour. Using French corn-fed chickens, the Chinese Chef has created a familiar chicken dish (at least to us Singaporeans) using traditional cooking methods - the addition of that scallion relish and oyster sauce will also remind of a simple dish that is done right. The Slow-cooked French Corn-fed Chicken with Scallion Relish and Oyster Sauce here at Racines does not try to reinvent itself because there is no need to - this simple dish is perfect on its own and the texture differences from using French chickens shine through in a non-gaudy way. For dessert, a specially prepared plate of Koi Fish Nian Gao was presented to us and these are quite possibly the cutest dessert that I have ever seen. The colours on the koi fish were incredibly-lifelike but the size of these fishes convinced me that they were not in fact not real. On the whole, I am impressed by the level of execution on these Lunar New Year favourites and while I personally did not find the steamed fragrant rice particularly memorable, the braised dishes were really good and I dare say that they are even better than many of the already-established Chinese restaurants in Singapore. I am quite excited to see Racines evolve in the year ahead as the dishes from the Chinese kitchen does not lose out to the French kitchen. While it is important to remember that Racines do not advocate fusion cuisine, I would interested to see how specially-curated set menus with both Chinese and French dishes could potentially work out.